I think it's safe to say that I've officially settled in. I've got my washday, diet, daily and weekly routines down. I know where most things are and I've bout everything I need to be comfortable. For the first time since I arrived I had to put in gas and while I believe self serve is fairly inefficient clearly it has the cost saving merit, oh if I never mentioned it all the pumps here are self serve. I've fully launched into my exercise routine and I'm inching towards being able to keep up with the people in the video...but we will see. Oh! today I went a lil extra with my meal. 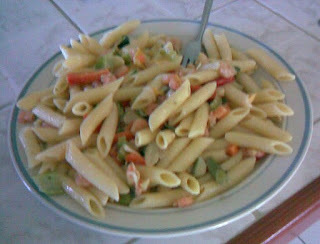 Penne Pasta with baby shrimp, stir fried vegetables and a home made Alfredo sauce. Went down pretty good :-). From here I should be able to rant on random things...as usual :-). u cooking for me next week???? Wait til you see the baked chicken breast and rice :P.